Whether you need to retain your entire driveway, the side of your home, or a small vegetable garden, the team at Earthly Possibilities can create a retaining wall with the strength and durability to last a lifetime. Retaining walls, while having a purpose, can blend into the natural environment and compliment the surrounding structures. Retaining walls can also be used for purely aesthetic reasons. They can provide a barrier that breaks up a patio area from a yard, provide visual appeal and create a sense of area. 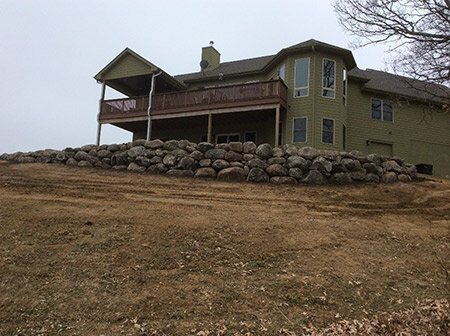 Retaining walls will aesthetically enhance your property’s slopes and grade changes. Walls can be constructed of a wide variety of materials such as boulders, outcropping stone, cut dry wall stone, concrete block, or other materials. Don’t lose precious yard space or worry about run off, which can cause square footage of your property to decrease; ask about our custom retaining walls and see your yard come back to life. Call us today to talk with one of our landscape designers!